The Best Reasons to use OSMO. It has natural ingredients; the hard wax oil is made of vegetable oils and waxes, is benzene free, using highly refined mineral spirits, with no strong chemical smell, low VOC. It’s simple to fix worn out areas or scratches without refinishing the entire floor and is as durable as polyurethane. It’s easy to apply with no sanding necessary between the only 2 coats, and 2.5 litres covers 250 – 300sq.ft. (for both coats). It has a beautiful satin finish that preserves the look of natural wood! For coating wood, cork, and OSB floors. Ideal for solid wood flooring, cork flooring, composites, oriented strand board and any unfinished wood surface. 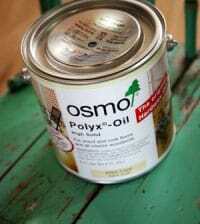 • Osmo Polyx®-Oils are hardwearing and extremely durable. • The surface is water-repellent, dirt-resistant and resistant to wine, beer, cola, coffee, tea, fruit juices, milk and water, according to DIN 68861-1A (German Industry Standard). • The surface retains its natural appearance and feel. • Available in .75 & 2.5 liter. cans. • Coverage: .75 liter. can covers approx. 190 square feet with one coat / 2.5 liter. can covers approx. 654 square feet with one coat. Above pricing is subject to PST & GST. OSMO products are only available for Winnipeg local pickup only. OSMO Hardwax Oil is an engineered finish made with plants oils waxes, plus just enough highly refined “benzene free” mineral spirits to allow easy application. This professional, satin-matte finish is of particular durability and resistance to floors, cork, woodwork and unglazed tiles. It offers natural flexibility of wood as well as excellent durability and renew-ability with a unique lustrous finish. It will never crack, blister, or flake off and leaves the wood looking and feeling natural.